Trikkur 9 is a good video for players of all skill levels to watch. I review some special ways that I table select with PokerTracker and also teach a new move called Stack-a-Donk. Even though I was focusing on table selecting and adapting to the fish; I actually manage to get beat up in quite a few pots. New players should be quick to understand that not every session you play will be a winning one. The best poker players in the world will have losing sessions and break-even stretches of play. Making sure that you learn from these losing sessions and maintain a positive attitude is crucial if you want to continue playing online poker long term. At the beginning of the video, I used a piece of software called SpadeEye to help identify the fish at different tables. Since this video was made, Full Tilt Poker has closed their doors and SpadeEye is no longer supported by the developers. If you want something similar to what I used, I would suggest buying a Premium Membership at PokerTableRatings. This will gain you access to their table selection tool that analyzes every table at different poker rooms and limits and tells you were the fishy players are located. Personally, I now prefer to table select manually with PokerTracker and the stats I’ve collected on my opponents. PokerTracker comes with a built in HUD (Heads Up Display) that will show certain statistics that you choose. You can see a picture of my HUD below and I specifically look at the VP$IP (Voluntarily Put $ in Pot) stat to find fishy players. VP$IP essentially equates to the percentage of hands that your opponent plays willingly and is the fastest way to tell if someone is a weak player. I try to find players that have a VPIP of 40 or greater and hopefully with a stack size of at least 50 big blinds. All you need to do is sit down at a few tables and wait for your HUD stats to pop up. If you see at least one fishy player with your PokerTracker stats, then you can sit in at the table and post your blinds. If there isn’t a good target at the table, then make sure you leave and find a new table. 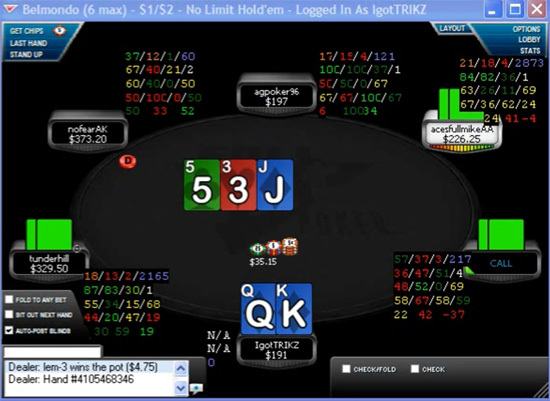 If you table select with the above method, you will run into two types of fish and they must be played against differently. You will either find the loose passive fish that likes to check/call every flop, turn, and river. This is your classic calling station and you should make very large value bets against them. Do not try to bluff a loose passive player because they will likely call. You will also find the loose aggressive fish known as a maniac. These are good players to be a bit trickier against and try to trap them post flop. They will likely bet if you check to them, which makes it easy to induce a bluff from them on later streets when you have marginal hands. If you finally catch a big hand versus a maniac, then you are likely to get paid off. One of my favorite moves to use against these loose aggressive bad players is called the Stack-a-Donk and I use it to good success during the training video. One of the easiest ways to extract value from your opponent’s when you have a big hand and want to get it all in is called Stack-a-Donk. This can only be used when you are first to act in the hand and want to play a very large pot. In a lot of instances, when you flop a big hand you should just bet the flop, turn, and river. If you are against a maniac though, you can bet the flop and check the turn to them. Most maniacs will not miss the opportunity to make a bet on the turn and you can raise all in. This turn check/raise all in is known as the Stack-a-Donk move. Most villains will not be able to fold after making a large turn bet, but even if they do so; you have extracted a turn bet from them when they would likely just fold to your second barrel. Now that you have watched a few videos of mine, you can see how useful PokerTracker is. Not only do I use it to review my own sessions and use it as a study tool, but now you can see how I use it to table select. Reviewing your opponent’s stats in PokerTracker can be helpful to spot weaknesses in their game, like the glaringly obvious high VPIP stats. I highly recommend all players purchase PokerTracker because it is a necessary tool for a serious player, but if you aren’t convinced yet – try out the 60-day free trial. You can download PokerTracker and use it yourself for 60 days and then make your own decision if it is worth the money to you.